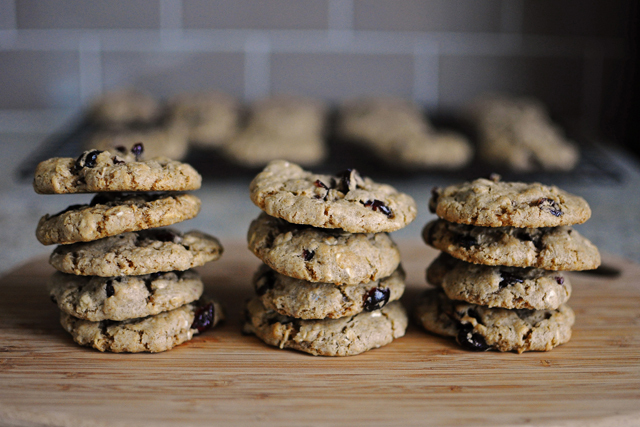 These vegan oatmeal cookies are a new favorite of mine. 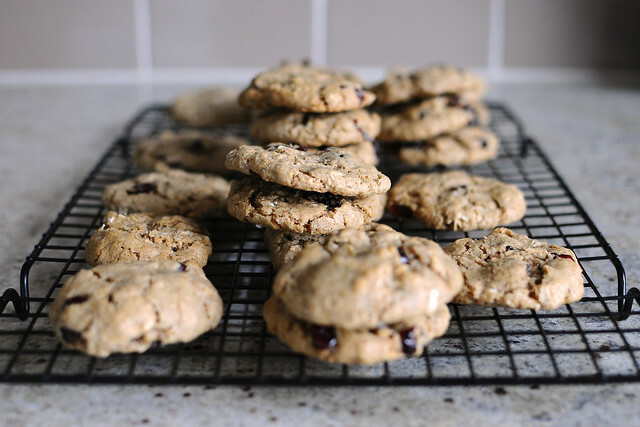 They are soft, chewy, and taste like a quintessential oatmeal cookie. They aren’t just really good vegan cookies–they are really good cookies… period. To create that rich flavor and texture that you would normally get from using butter, these cookies use a number of surprising ingredients. In addition to the usual suspects (like flour and oats), they also have finely ground toasted walnuts, coconut oil, maple syrup, and almond milk in them. It’s amazing that with all those ingredients, they still manage to taste like oatmeal cookies… really, really delicious oatmeal cookies. 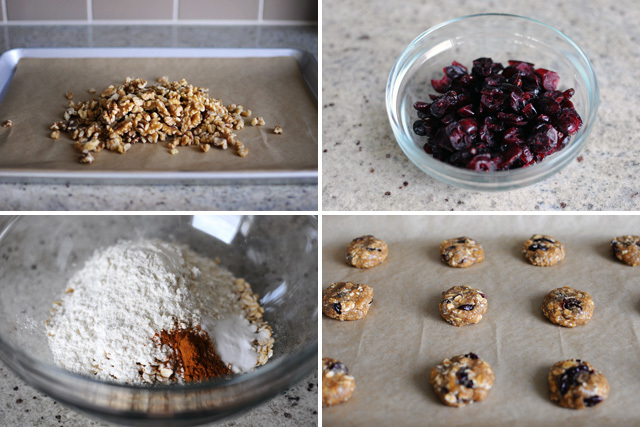 I often use dried cranberries instead of raisins when I make oatmeal cookies, purely out of personal preference. If you like raisins, go ahead and use them instead. I have also made a version with dried cherries and cacao nibs that I like as well. Heat the oven to 350 degrees and line a baking sheet with parchment paper. Place the walnuts on the baking sheet and toast them in the oven for about 10 minutes, until the nuts are golden and you can smell them. Let the walnuts cool for a few minutes. In a food processor, pulse the cooled walnuts until they are finely ground (be careful not to over process them or else you will end up making walnut butter). In a medium bowl, whisk together 1 cup of the oats, the flour, brown sugar, baking soda, and cinnamon. Add the dry ingredients to the food processor with the ground walnuts and process for about 20 to 30 seconds, until well mixed. In a small bowl or glass measuring cup, microwave the coconut oil for 20 seconds to soften it. Then add the maple syrup, almond milk, and vanilla extract and whisk to combine. Add the wet ingredients to the food processor and process until the dough comes together and is well mixed. Transfer the dough mixture to a large bowl and stir in the remaining 1 cup of oats and dried cranberries. Portion out 2 tablespoons of dough per cookie, rolling them into balls and flattening them slightly before placing them on a parchment paper lined baking sheet (the same one you used to toast the walnuts). I fit 12 cookies per baking sheet. Bake for 10 minutes, until lightly golden. Cool for 2 minutes on the baking sheet before transferring to a rack to cool completely. Repeat with the remaining dough. Makes about 30 medium sized cookies.